You are currently browsing the tag archive for the ‘customs’ tag. Today, December 6th, is one of the bigger holidays in Bulgaria: Nikylden, or the Day of St. Nikola Mirlikiiski, or St. Nikola the Miracle-Maker. St. Nikola is the guardian of fishermen, sailors, travelers, tradesmen, and bankers (Who can tell me what the connection between them is ?). Nikola was a historical figure born in 270 BC in Patara (today in Turkey). Legend says he inherited a great fortune from his father but gave it all away to those in need. The saint also performed many miracles that delivered sailors and fishermen safely from sea tempests. According to another legend, he plugged a hole in a ship with a carp fish and thus saved it from sinking! Nikylden is more than a religious day for the Orthodox Christians; it is also a nameday for all bearers of the name Nikola, Nick, Nikoleta, Kolio, Nikolai, Nicholas, etc; actually, most Bulgarian families celebrate the holiday even if they don’t have a Nick in the family. 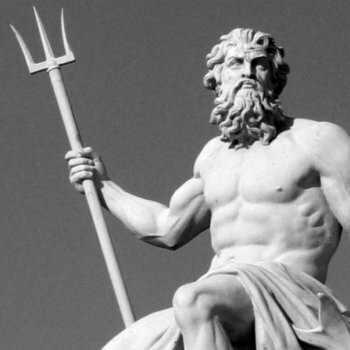 St. Nikola is also associated with the sea, ocean, rivers, and lakes, and in this sense is similar to the Greek god Poseidon (called Neptune in Roman mythology). Germanic nations also celebrate St. Nicholas’ day, although slightly differently, and even associate this saint with Santa Claus. 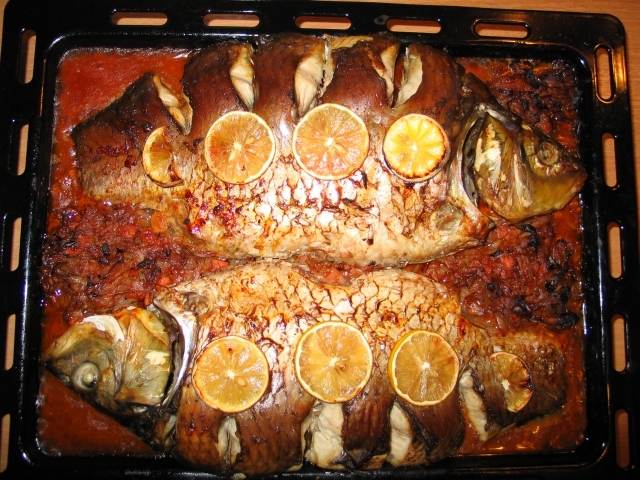 In Bulgaria, we eat fish on December 6th – preferably fish with scales like carp or sheat-fish because “naked” fish without scales symbolized poverty. 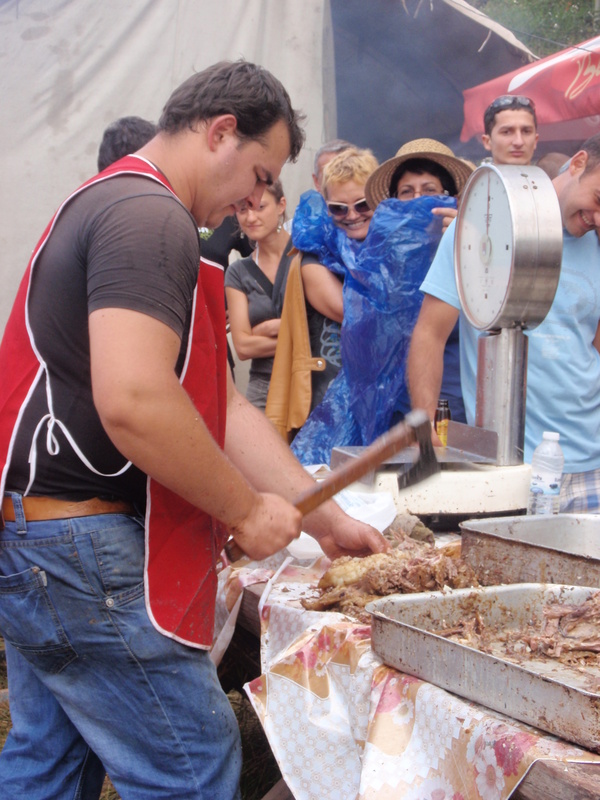 We bake the fish whole and stuff it with walnuts (check out a few typical Bulgarian Nikylden recipes here). To me and my family, the Nikylden feast is the equivalent of a Thanksgiving Feast because my father is called Nikola and he is a “tradesman”. This means that my house is always full of guests on this day! Traditionally, you don’t send official invitations for your nameday: you are supposed to prepare a big meal and expect your closest people to show up for dinner by themselves. So you basically never know who is showing up until they do, but you expect your closest relatives, godparents, best man and woman, and good neighbors to pay a visit. They might bring flowers, alcohol, and other presents. Don’t expect them to leave before 2am. Stuffed carp - I want to be home right now! The table is, naturally, very festive! In addition to the stuffed carp, my mother also prepares salmon, shark, scard fish and turbot (eh, probably not all of them every time!). 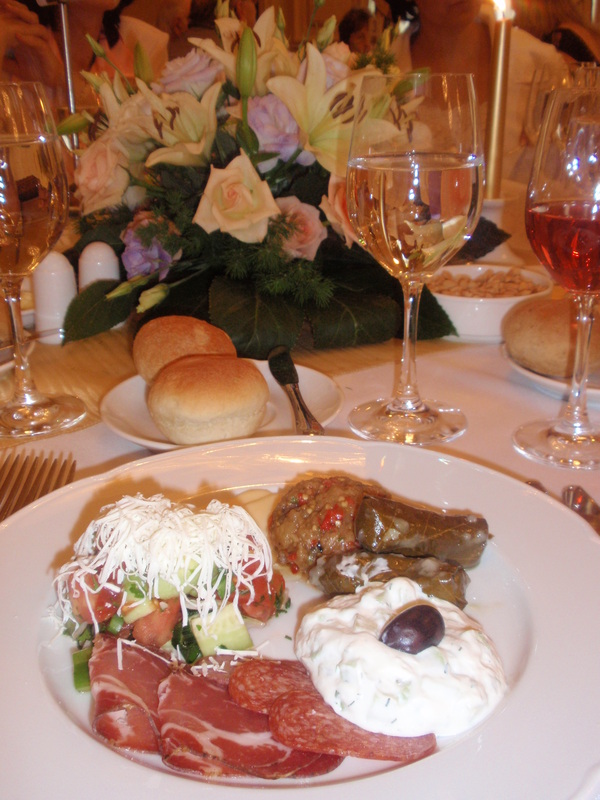 We have a variety of salads and other yummy dishes and lots of wine – Villa Melnik of course! I’m so angry I missed it again this year, but HAPPY NIKYLDEN, DAD! Namedays are very big in Bulgaria, maybe even bigger than birthdays. There are less presents for the person celebrating but more of a communal feel since this day is not a personal celebration, but a celebration of all people who bear the same name, of the saint, and of all the virtues that the saint represents. I love my name, Militza, because it is the name of my great-grandmother and is very rare, but I’ve always been jealous that it is too rare to have a saint or a nameday associated with it! Oh well, I just get to celebrate my birthday and half-birthday! 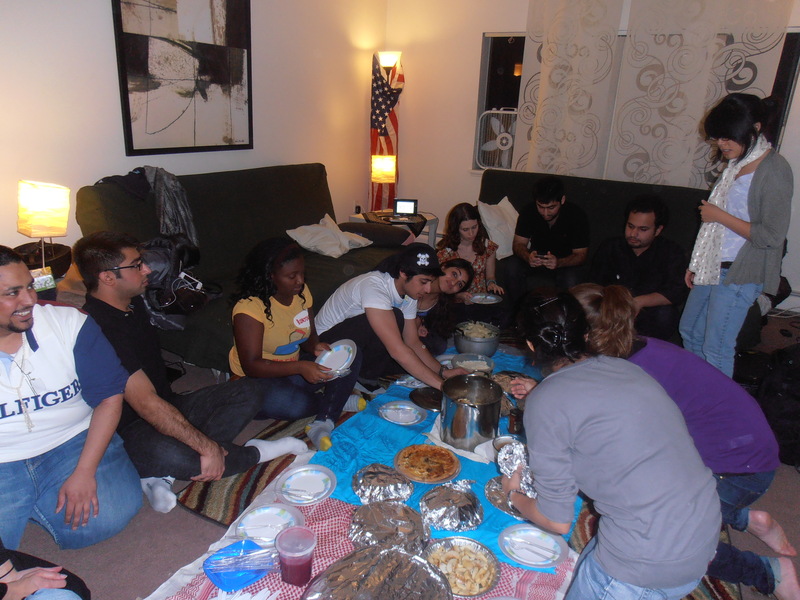 It’s not easy to be an international student in the States on Thanksgiving. They kick you out of the dorm for 5 days, all of your friends scatter to their respective places of origin, and you have to be very creative in finding what to do. My strategy has been to try to be as traditional American as possible in order to experience the culture. Funny how that turned out! The Grosse family was so kind to invite me and two other Bulgarians to their home in New Jersey over the Thanksgiving break. 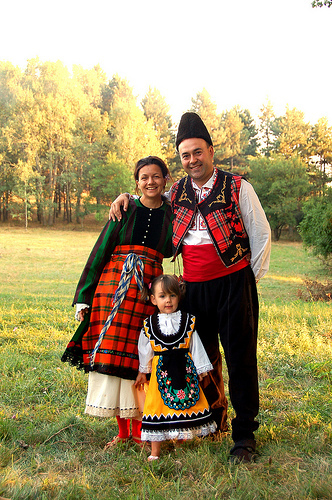 The Grosses used to live in Bulgaria and their daughters, the two half-Bulgarians as I like to call them, went to my high school in Sofia. So in 2008, they got together me and two other girls from that school who currently go to college on the East Coast. For dinner, we had all the ingredients of an American Thanksgiving Feast, but prepared the German way – potato dumplings, sauerkraut (German red cabbage), turkey breast (without stuffing), mama Grosse’s secret saus, all sorts of delicious German pastry (with strudels instead of pies), and of course, Bulgarian Red Wine Tcherga. My cultural experience was further enriched with Black Friday shopping in the Short Hills Mall. Another not-so -typical holiday, I guess. Timmy and I went to Orlando, FL, where we spent the day riding on roller coasters, trying to get out of haunted houses, and spinning on all sorts of carousels. We saw a mini-city made up entirely of Christmas Lights, but didn’t really experience anything particularly Thanksgiving-ly other than the roasted turkey leg on the bone that Timmy and I devoured. 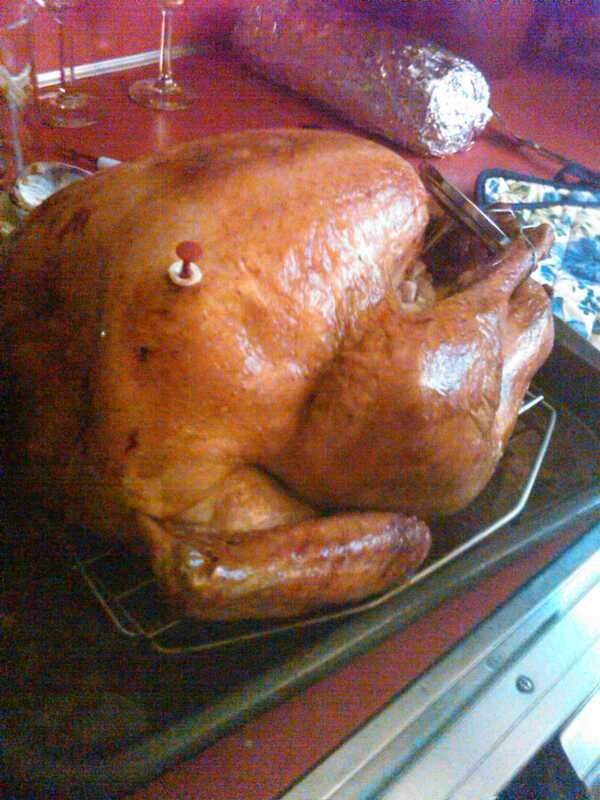 Now this was the epitome of Thanksgiving! We were in Plymouth, MA, where the Mayflower dropped anchor. We saw the Plymouth rock, which marks the symbolical spot where the pilgrims landed and the “Plimoth Plantation”, which is a living history museum. At the Plantation, we visited a 17th century English village that recreates the way the pilgrims lived. There are costumed actors who have adopted the roles of actual historical figures and pretend that it is still 1627. So when I told them that I am from Bulgaria, they asked me how things were in the Ottoman Empire! Their historical knowledge was impressive! The other part of the Plantation is the Wampanoag Homesite where you can meet real Native People and talk to them about their culture and history from a modern perspective. Finally, I had a very American, very lovely Thanksgiving lunch with Timmy’s family : with a house full of bubbly relatives, mountains of food, and football! Exactly as Thanksgivign should be! Read more about my meeting with Timmy’s family here. My roommates and I organized a pretty interesting semi-traditional feast for our friends. (Actually, Emma, who started preparing the turkey three days earlier and woke up at 7am to start cooking that day, should get all the credit. I simply decorated the living room with real fallen leaves, but then it ended up in vain because our oven exploded the night before and we eventually had to move the party to a different apartment, the so-called “Arabs’ place”.) So, Emma ended up cooking for 30 people, most of whom were… Arabs! She invited all of us to hold hands and say what each of us is grateful for. Then we all sat down on the floor, Americans, Pakistani, Saudi, Bulgarian, German, and Chinese (in front of the American and Saudi Arabian flag?! 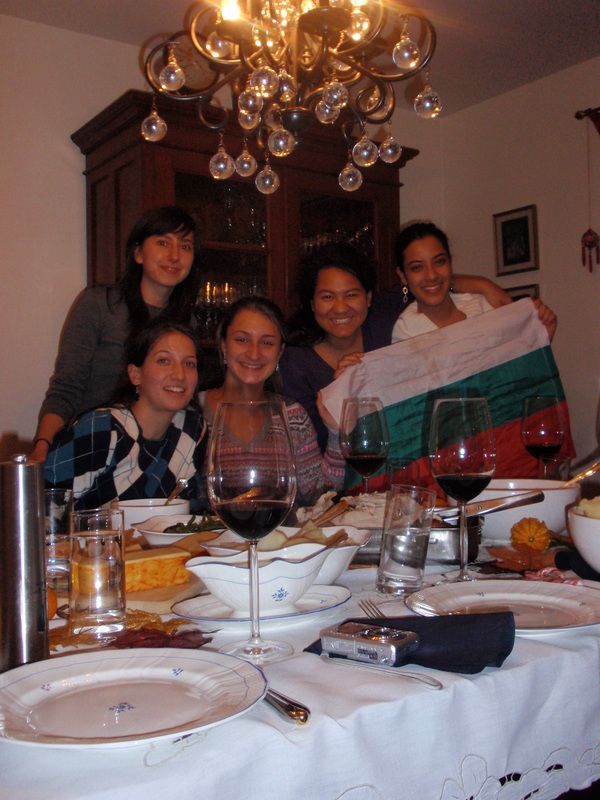 ), and had the most international Thanksgiving dinner so far! So I am pretty sure that I now fully grasp the meaning of Thanksgiving! 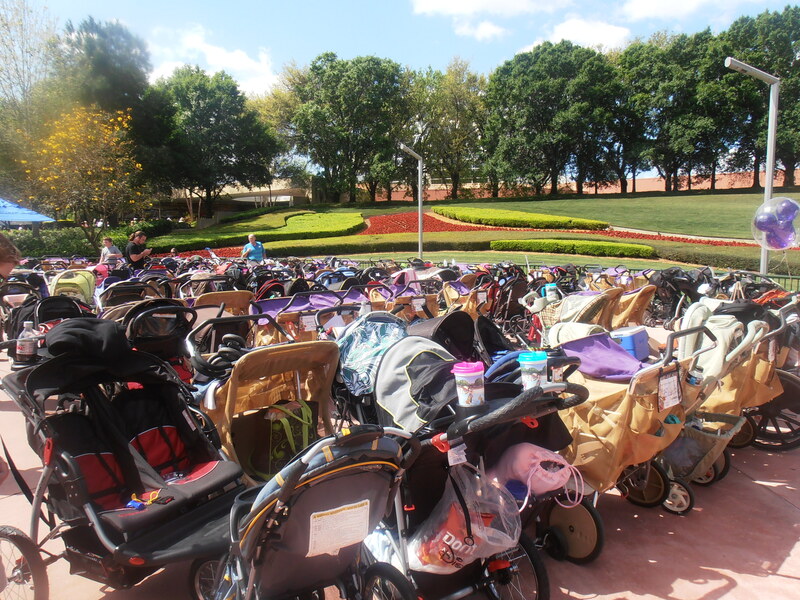 This holiday is about bringing people together and allowing them to share a beautiful experience like one big family! Cheers! 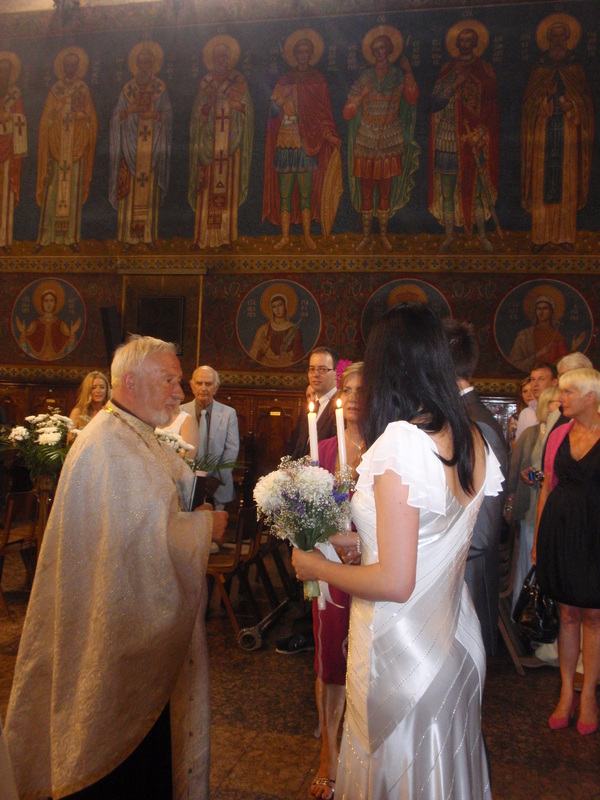 On Sunday, I went to a fabulous Bulgarian-English wedding at the St. Nedelya church in Sofia. I want to tell you more about the mother of the bride because she is an exceptional woman! She is married to an Englishman, and they have lived in London forever, yet their two children (the bride and her brother) were baptized as Orthodox Christians instead of Anglicans like the father. 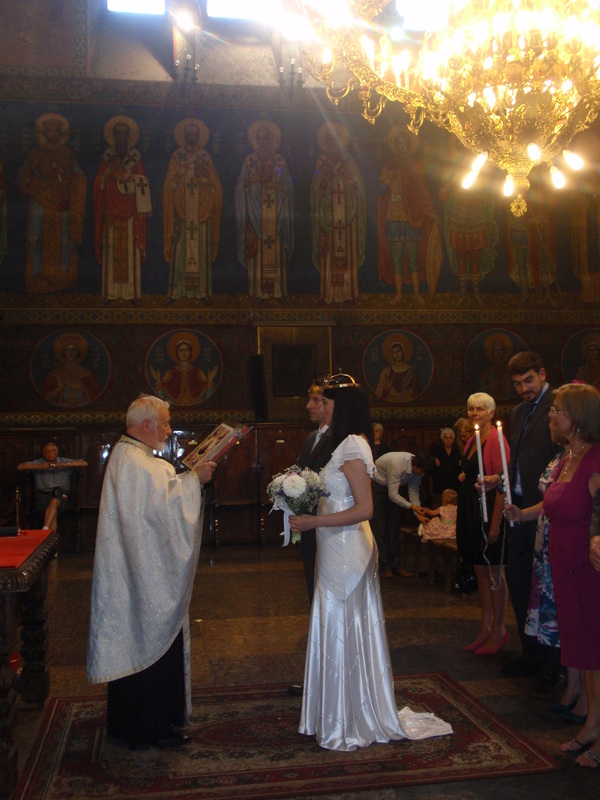 This Bulgarian woman has taught her children such love and respect for their roots that the bride decided to marry in Sofia, in an Orthodox church, despite the fact that her groom and his family (and her own family on the English side) are Anglican! Thus, the groom, his parents, and all of their British guests, including some guests from Brunei, had come to our St. Nedelya church for the ceremony! To make everything perfect, they baptized their little baby boy as an Orthodox Christian too! The wedding ceremony in the beautifully painted church was lead by two priests: one to perform the ritual, and one to sing accompanied by the choir. 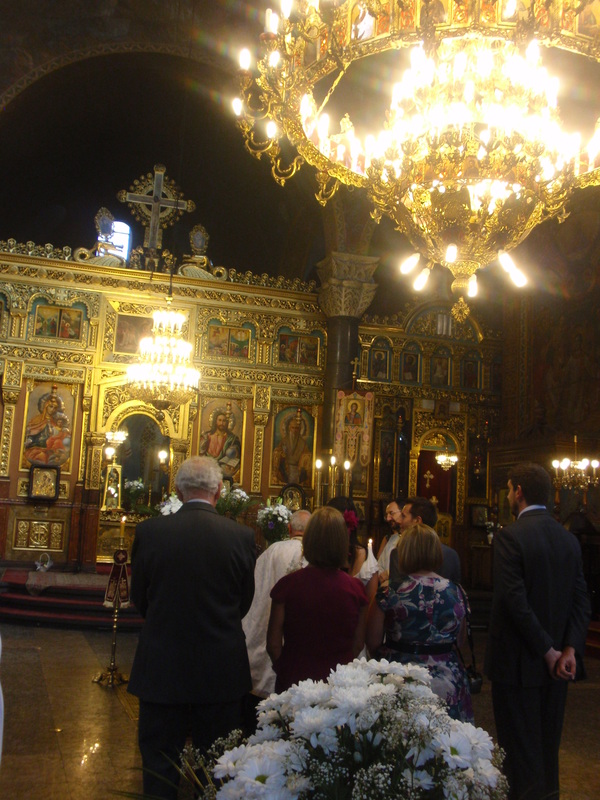 Then, all the guests, mostly British and a few Bulgarians, went out of the church and reentered a few minutes later for the second ceremony, the baby’s baptism. The baby started to laugh as its feet touched the water basin! Next, we all headed for the Sheraton, Sofia’s oldest and most renowned hotel. 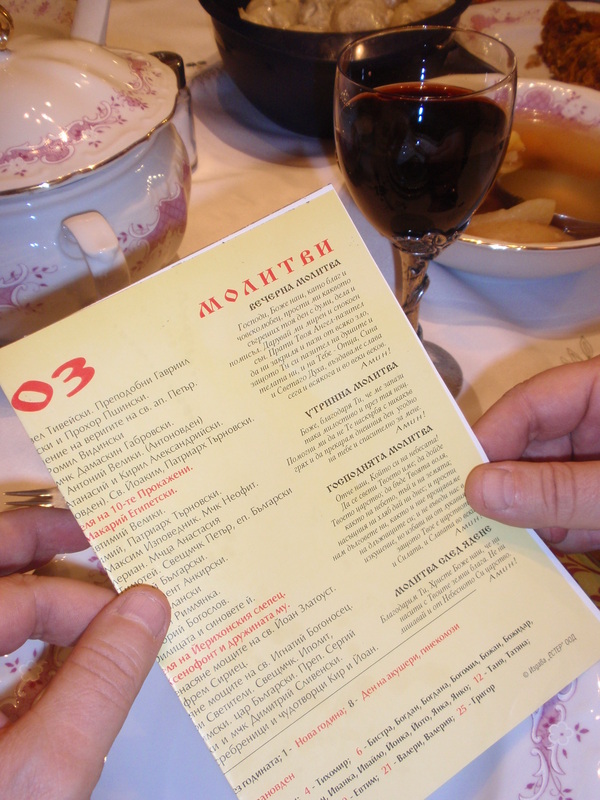 The menu was only typical Bulgarian cuisine presented in a gourmet way. The entertainment was splendid too: four dancers in national garments and a folklore singer and bagpiper kept both the foreign and local guests in good spirits all night long. The Brits picked up our rhythms surprisingly fast! This was a wonderful transnational interreligious wedding, and it was all made possible thanks to the vigor of that incredible Bulgarian mother of the bride who not only preserved her national sprit in the foreign land, but also continued it through her children and grandchildren. or about a rather upsetting baptism ceremony in an Orthodox monastery. 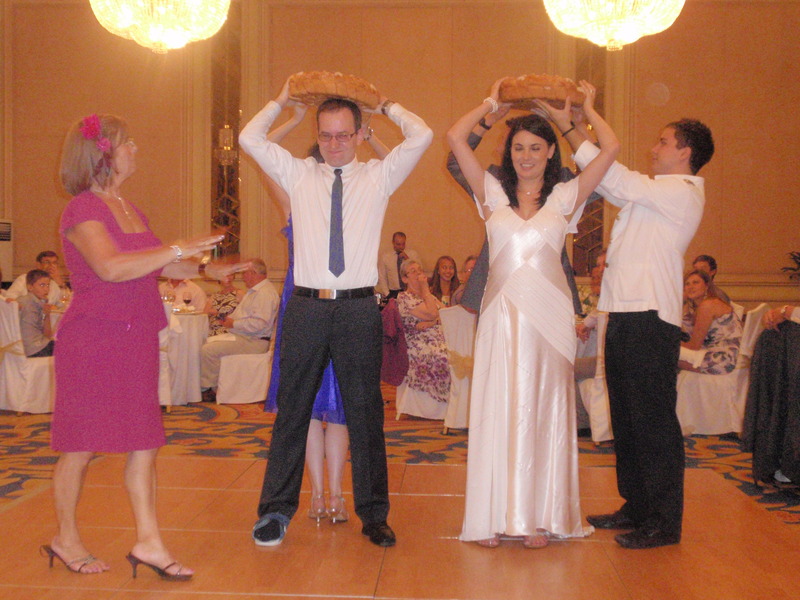 Traditional breaking of the bread: whoever breaks the bigger part off the bread will be the leader in the home. These are two couples: the newlyweds and the bride's recently married brother and sister-in-law. I uploaded these videos from the party at the Sheraton Hotel. I think it’s obvious who are the Brits and who the Bulgarians! Enjoy! Previously, I wrote about my dad’s 30-year-old fridge from Socialist times. Now I’ll talk about British ovens. This is an AGA cooker. According to Wikipedia, it is a “stored-heat stove and cooker invented in 1929 by the Nobel Prize-winning Swedish physicist Gustaf Dalen.. chief engineer of the Swedish AGA company”. Dalen actually invented it while he was blind. But mind you, the Aga cooker is more than a stove. For the British, it is a sign of prestige and dignity. The Aga is extremely energy inefficient (425kWh per week compared to 580kWH per year for a normal gas oven), extremely impractical (with its four ovens and as much steel as a small Korean car), practically indestructible with its at least 50 years lifespan, and godlessly expensive, ranging from $13,000 to $30,000. But Aga is something of a cult for the Brits from the middle and upper class. 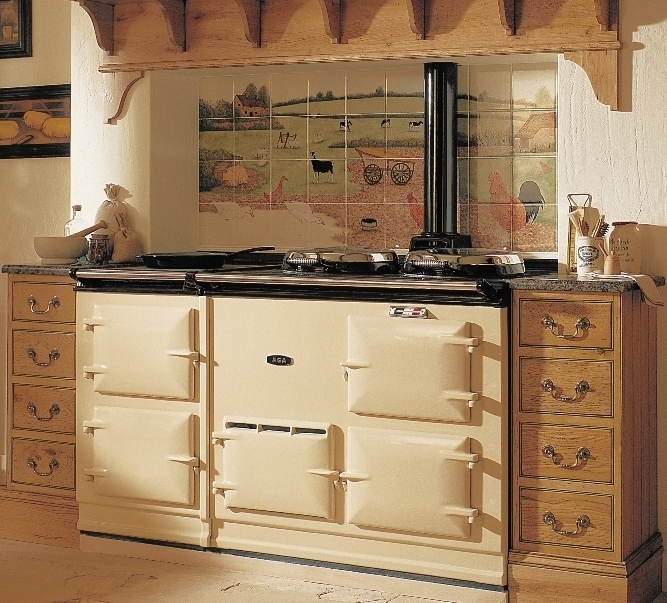 With its olden-days-looking exterior and robust interior, the Aga personifies the British taste for tradition and style (or traditional style). That’s why it is usually the centerpiece of the house. A housewife will always show off her Aga to her guests. In fact, out of the entire home, the British invest the most money and effort in their kitchens, which is quite paradoxical since they are known for their mediocre cuisine (which I don’t really agree with). And if you look at the official Aga website, you will see that the Aga culture is very similar to the Harley Davidson Rider’s Club – Brits simply become one with their Aga. 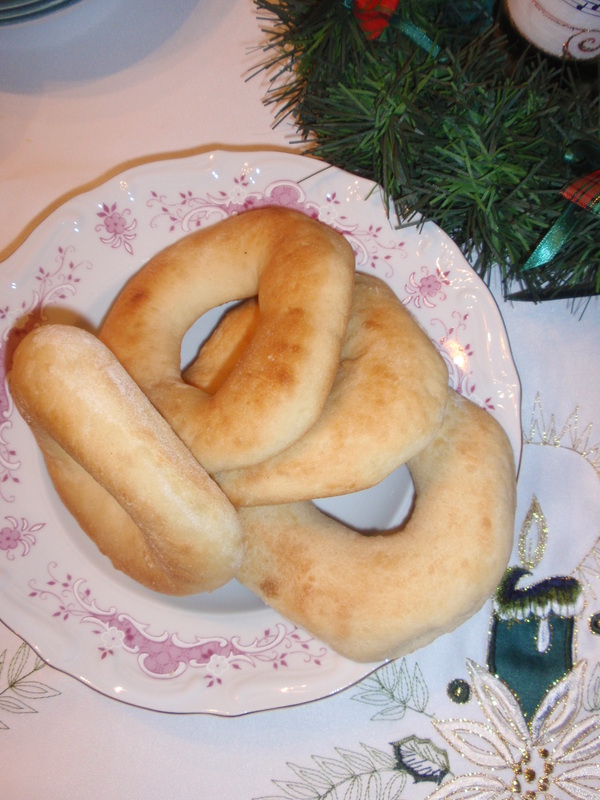 Bulgarians are denominated as Greek Orthodox Christians, so we celebrate Christmas Eve on December 24th. 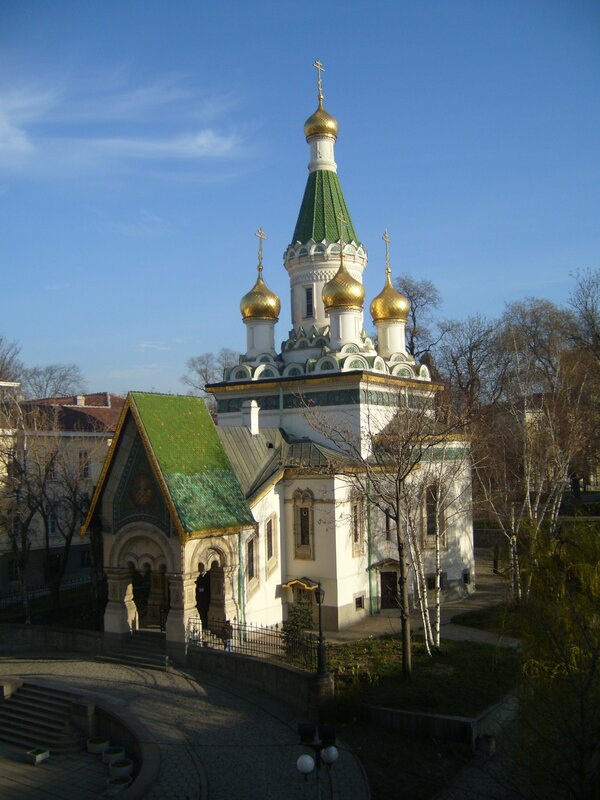 (In contrast, other Orthodox countries like Russia, Georgia, Ukraine*, Macedonia, Montenegro, and Serbia follow the tradition of the Russian Orthodox Church and celebrate Christmas Eve on January 6th and Christmas on Jan 7th). It is a very private holiday, and is always celebrated by the (closest or extended) family at home. On the morning of December 24th , my mother and I clean the entire house early and start preparing the meals. We are supposed to have fasted for the past forty days, but none of us is that religious or, as a matter of fact, that strong-willed. 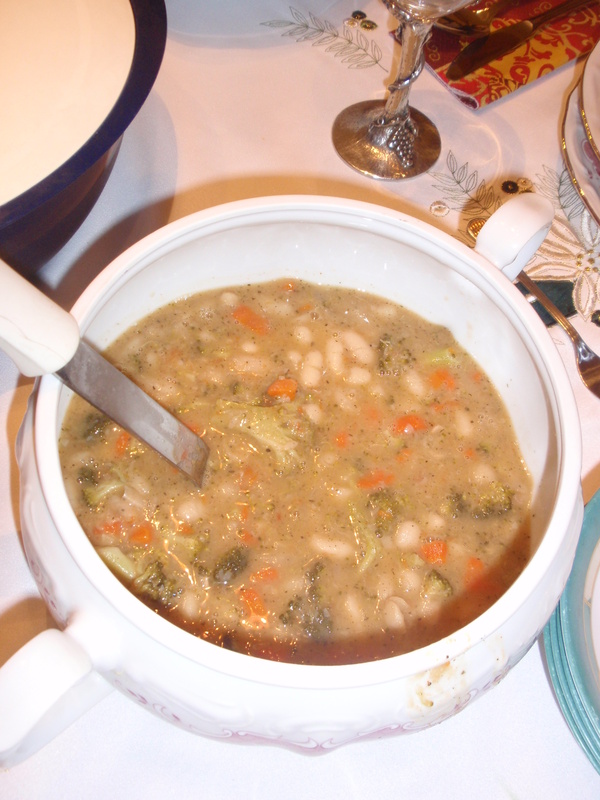 But even though we don’t fast, we always make sure that the Christmas Eve dinner is free of meat, cheese, butter, etc. According to the custom, we prepare an odd number of meals. Scroll down to learn more about each one. We all sit around the table, and my father (or the oldest person at the table) reads the prayer. Then he breaks up the pitka, a special bread that my mother makes from flour, salt, water, and yeast only. The first piece is for the Mother of God and Her Son. The second one is for the house, and after that dad distributes the rest of the bread to the four of us. 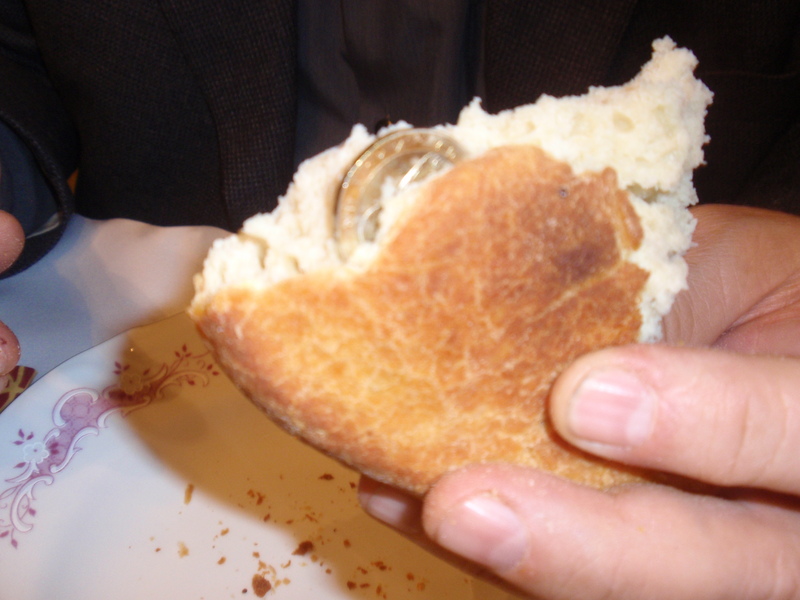 Then we look for the hidden coin in the bread, which would bring good luck and prosperity to whoever finds it! This year, the coin was in my father’s piece, which is ok because it takes the pressure off me and my brother! 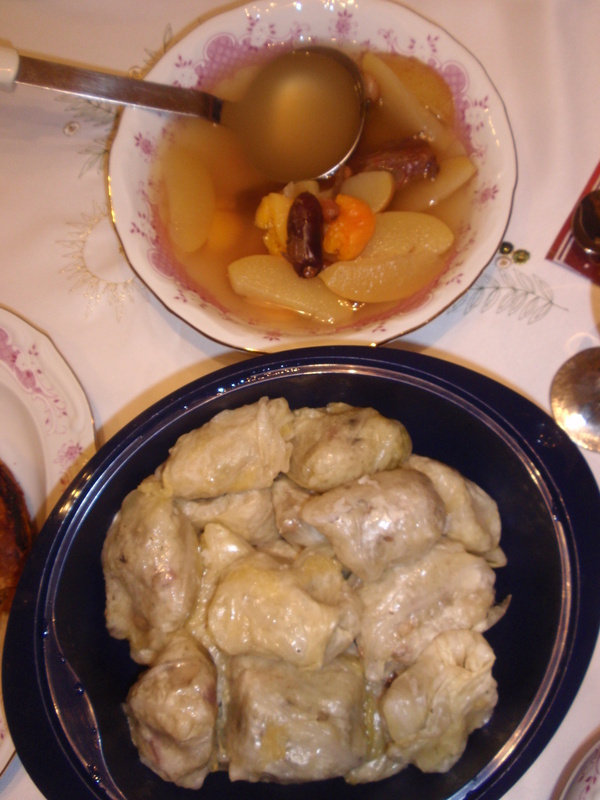 In addition to the bread, we have bobena chorba (bean soup), zelevi sarmi (rice stuffed in sour cabbage leaves), kolacheta (donut-shaped bread), two types of tikvenik (pumpkin banitza), oshav (fruit compote), and fresh fruit. We drink red wine (yes, even my seventeen-year-old brother, Viva Europe!). All the meals should remain on the table throughout the night, so that the good luck does not leave our house. My family exchanges presents before or after dinner. I guess we just don’t have the patience to wait until Christmas Day morning like Americans do. In the past, my mom would make me and my brother walk the dog. Then as we come back in, she would tell us we just missed Santa by a few minutes, and we would rush toward the Christmas tree. We do decorate Christmas trees and we do have Santa in Bulgaria. The older generation actually knew the Soviet version of Santa Claus, Diado Mraz (Grandpa Frost). Diado Mraz is very similar to Santa with the only exception that he is usually accompanied by his daughter, Snezhanka (SnowWhite) and brings us presents on New Year’s Eve. We then spend the rest of Christmas Eve watching movies or Christmas concerts on TV or playing games. It truly is our most favorite family holiday! 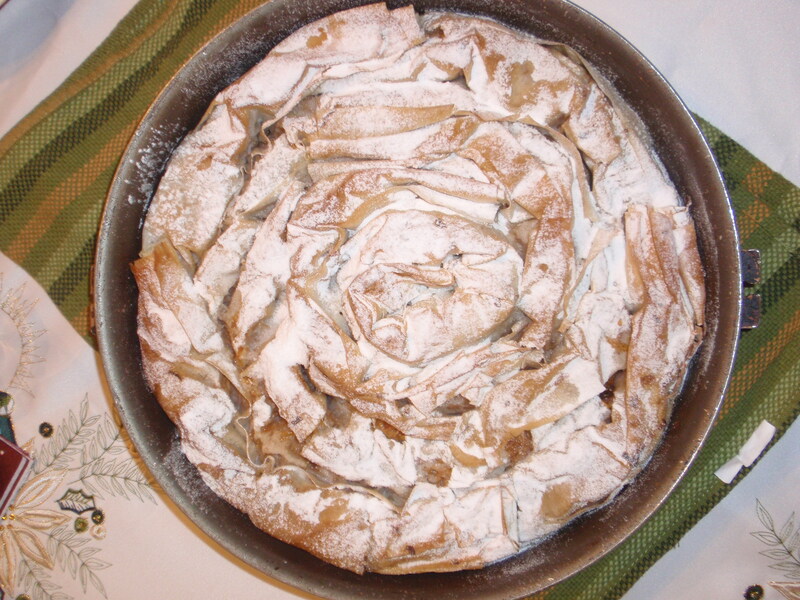 Tivkenik, or pumpkin banitza with walnuts is the ultimate Bulgarian Christmas dessert. I made this one! I just came back from the best ski resort on the Balkans, Bansko! Bansko is a charming town in the north-east part of the Pirin mountain, situated at the foot of peak Vihren (2914m). The town’s unique architecture, combined with the new hotels, the entertainment establishments, and the modern ski and snowboard facilities, makes Bansko a favorite winter destination for foreign and Bulgarian tourists. In total, the ski slopes in Bansko are 70 km long, and with the help of my ski instructor, I’m proud to say, I conquered almost 10 of them! Not only did this patient, dedicated person teach me how to fall, stop, and turn (in this order), but he also introduced me to a key skiing concept: après-ski. 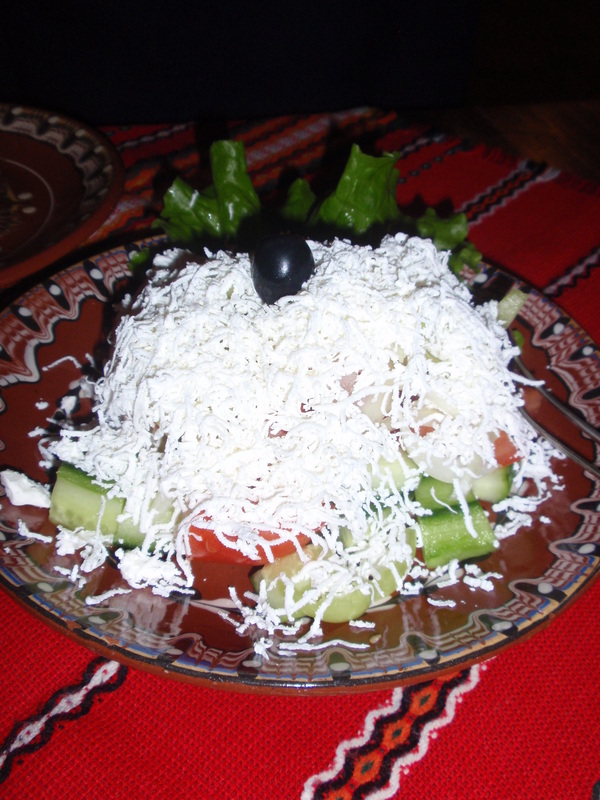 Let's begin with the quintessential Bulgarian dish, Shopska Salad: fresh cucumbers, tomatoes, and onion, roasted red peppers, lots of sirene (white feta cheese), parsley, and a kalamata olive. 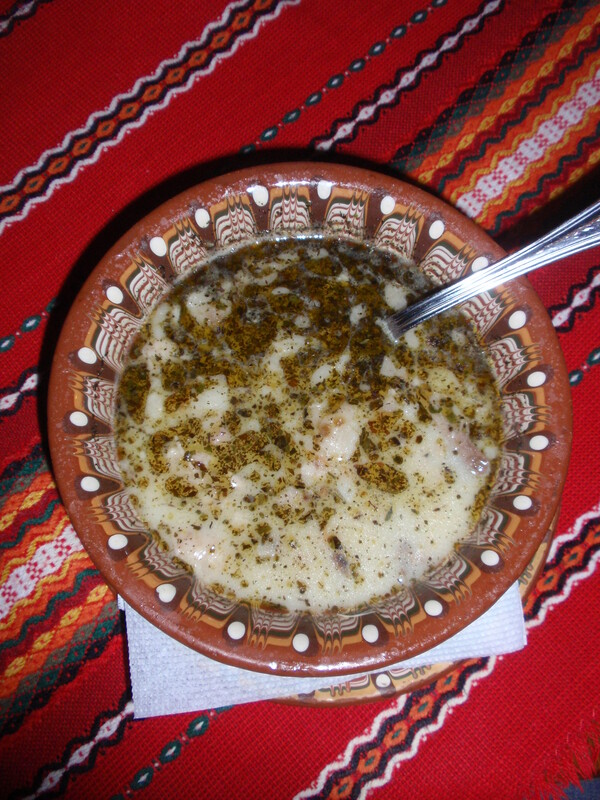 Continue with warm agneshka chorba (lamb soup). Notice the clay bowl and the table cloth with folk motifs. A sach is a hot clay plate. 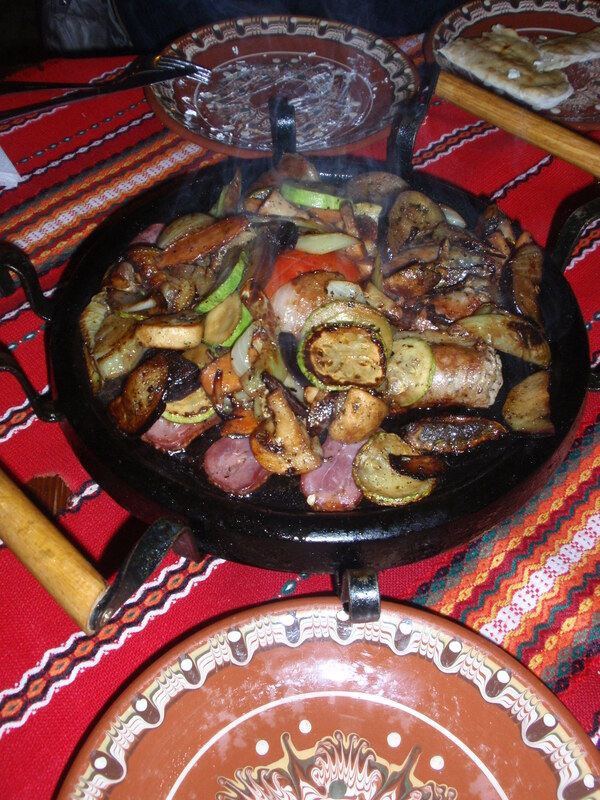 The Banski sach meal can contain a mix of different meats and vegetables. This one has two types of sausage, aubergines, zucchini, tomatoes, carrots, onion, peppers and mushrooms. There should always be meze on the table to go with the hot mulled red wine from the Melnik region. 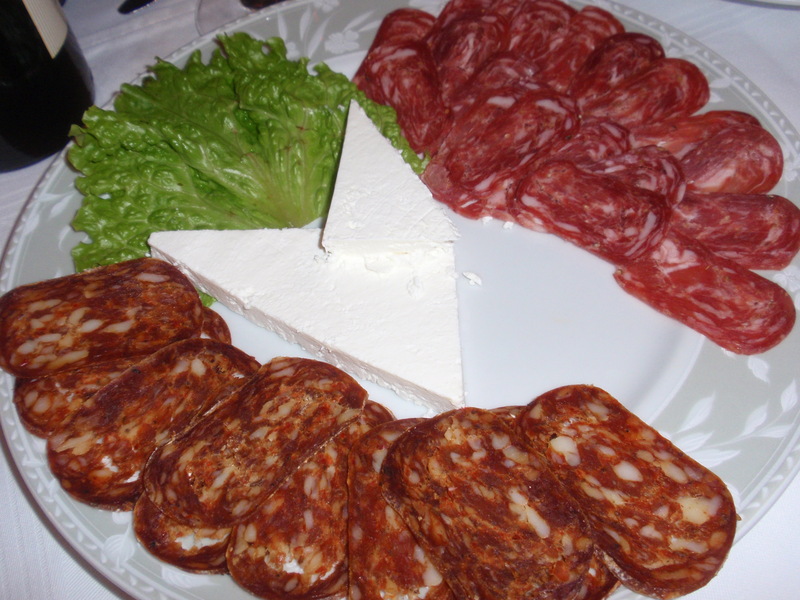 Here you see sirene (white cheese) and two types of lukanka, one of which is the famous Banski staretz ("old man from Bansko".. I hope it's not what it sounds..). 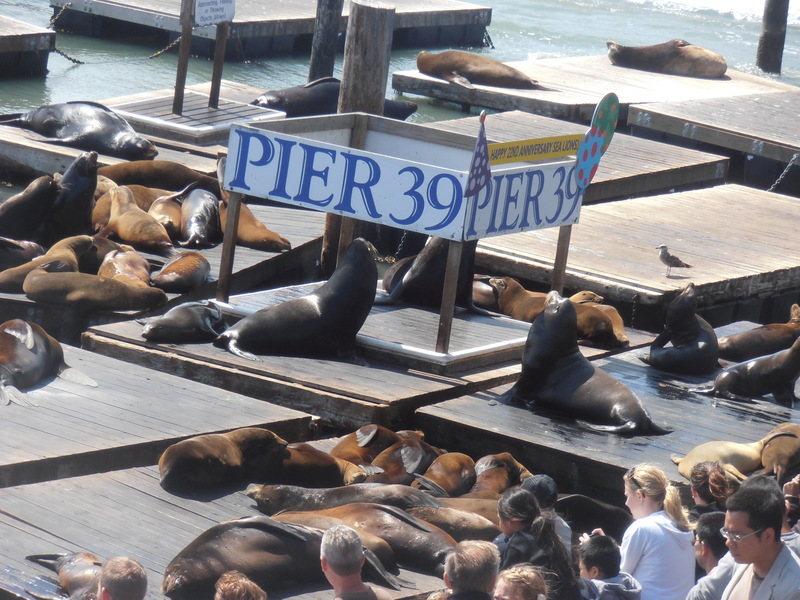 After all this food, you don't need any dessert! 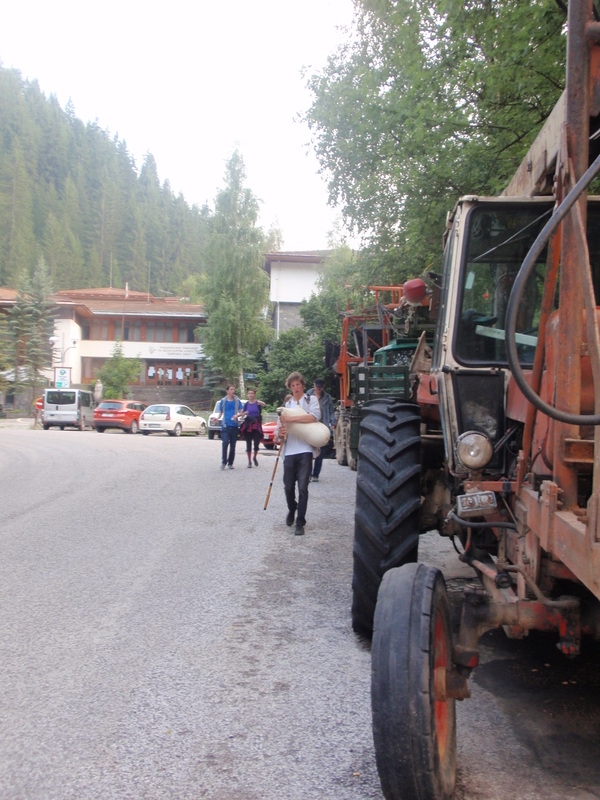 What else happened in Bansko? This town is famous not only for the great mountain resort, but also for its rich history and culture. Here, on August 21st 1901, the Bulgarian revolutionary Yane Sandanski kidnapped the American missionary Elen Maria Stone and held her for six months until the attention of the whole Western world fell not only on the kidnapping but also on the fate of the entire Balkan peoples after the fall of the Ottoman Empire. Read my previous post to learn more about the international crisis known as the Miss Stone Affair. “I’m really sorry. My family is crazy,” Timmy said. In the grandparents’ cozy dining room, around the festive table, Timmy’s gregarious family members and I were celebrating my first real Thanksgiving, Irish style. In the beginning, there was a big fuss about who is sitting where because no one wanted to sit next to the two left-handed people; no one wanted to get elbowed from the left. The merrymaking continued throughout dinner, and the most cheerful giggling came from Timmy’s mom and her twin sister’s corner. Next to me, his other aunt was teasing her son, a second-year frat-boy, about his older Latina girlfriend. This aunt also said that I don’t have to eat Timmy’s mom’s jelly if I don’t like it, and instead passed me her own tomato and pesto stuffing. Meanwhile, the twin and her husband started arguing about their year of marriage. When it turned out that she was wrong, she lovingly nagged him about his Southern accent. In the other side of the table, Tim’s mom was asking if we could please take a bite from a dish that her colleague at work had made, so that she could at least say that we tried it. As a good son, Timmy was trying from everything… several times: the sweet potato casserole, the cranberry jelly, the stuffed baked clams, and of course the mouthwatering turkey. At one point, his dad tried to cut the family’s volume in order to hear Timmy’s sister’s greetings from California over the phone’s loudspeaker. In order to send a picture to the cousins who couldn’t make it this year, the grandmother instructed us to pose in front of the camera. We ended up having to take six or seven shots because she kept telling Timmy to put on a normal face. Then everyone praised the grandmother’s special apple pie, and the grandfather proudly pointed out all her handicraft on the walls and shelves. Then In the end, everyone asked her for a different digestive: various teas, coffees, mint candy, and brandy. Timmy’s mom blamed him of being an alcoholic for asking for brandy. “Every family is a little bit crazy,” was my response. Thank you for a charmingly crazy Thanksgiving! What do Katy Perry’s Purr and Chanel No.5 have in common? Bulgarian Rose Oil! The Bulgarian Rose is an essential ingredient of Katy Perry's debut fragrance, Purr. Let me tell you more about the legendary Bulgarian rose. There is a place in Bulgaria, between the Balkan Mountain Range (Stara Planina) from North and Sredna Gora Mountain on the South and Stryama River to the West and Tundzha River to the East, called the Valley of Roses (Rozova Dolina). 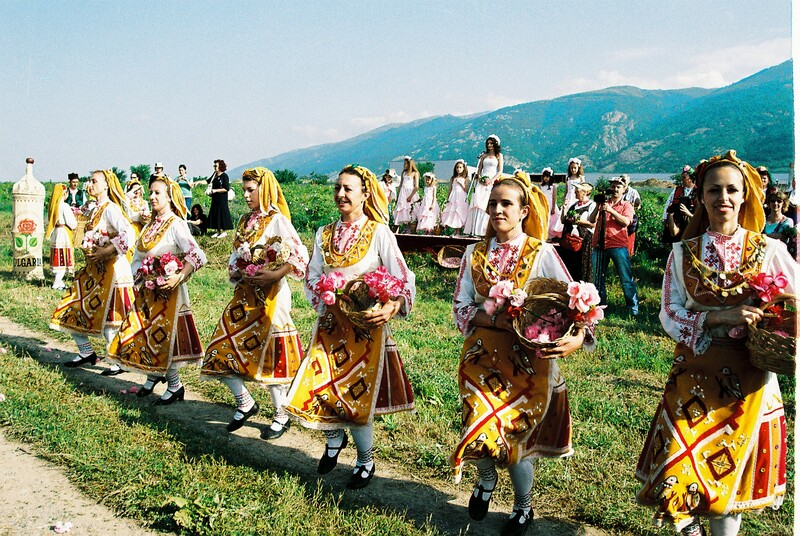 For centuries, people here have cultivated the Kazanlak Rose and extracted its valuable Rose Oil. 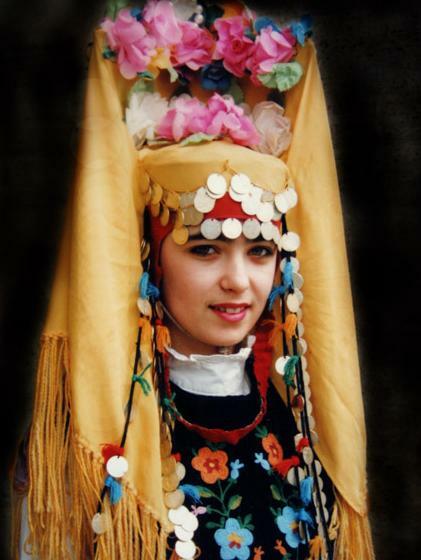 The Kazanlak Rose is one of Bulgaria's national symbols. The scientific name of the Kazanlak rose, named after the major town in the Valley of Roses, Kazanlak, is Rosa Damascena. It has very small but very fragrant pink and pink-red flowers. From its petals, we produce the world-renown Bulgarian Rose Oil, also known as Rose Otto or Rose Attar. Bulgaria is the largest producer of rose oil in the world. Other top producers are Turkey, Morocco, Iran, France, and Italy. The rose oil is widely used in the perfume, cosmetics and pharmaceutical industries (Read more about Rose Oil Info and Uses). Some of the perfume brands that use rose oil as their essential ingredient are Dior, Givenchy, Kenzo, Gucci, and Nina Ricci, but undoubtedly the most famous perfume containing Bulgarian Rose is Chanel No.5. The oil is contained even in the most expensive perfume in the world, Imperial Majesty by Clive Christian, which sells for about $300,000 per 500 ml bottle. Rose oil production is very labor intensive and requires great expertise. The petal-picking season lasts only 20 days in a year. To preserve the best qualities of the petals, the rose-pickers, traditionally young girls, have to gently pick the blossoms one by one early in the morning, before the rising sun evaporates the dew from the petals. Naturally, the rose-picking season is an occasion for celebration. 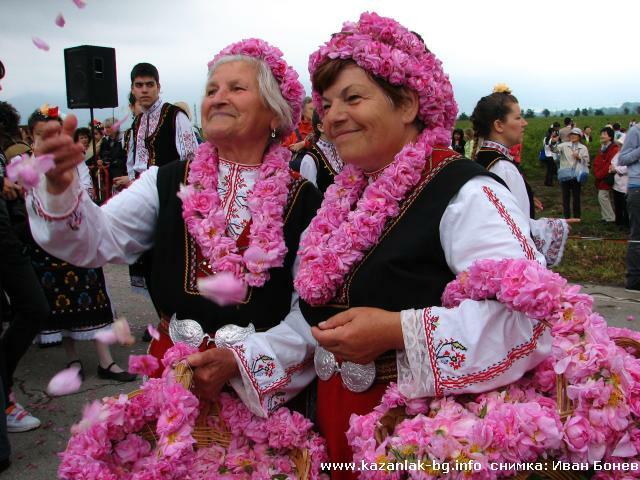 The Bulgarian Festival of the Rose proves that beauty is ageless! 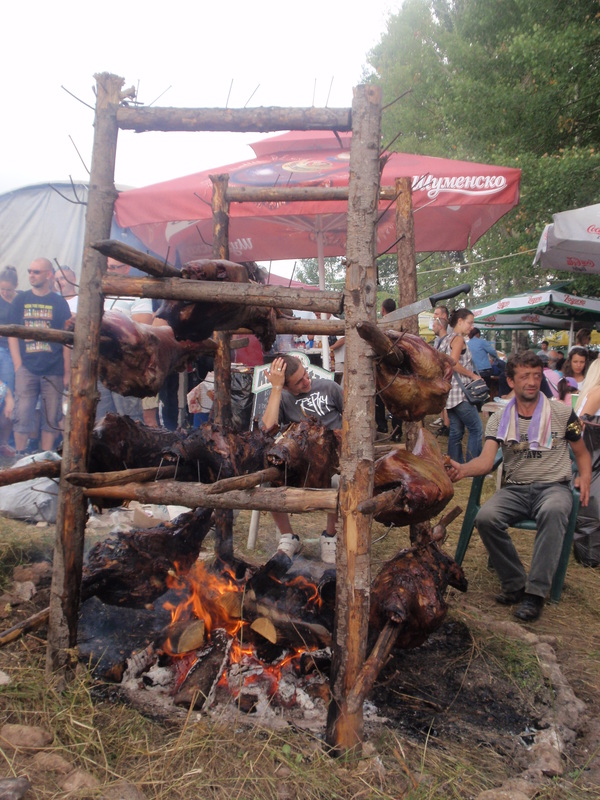 The Festival of the Rose (read more) takes place in the beginning of June in Kazanlak since 1903. Some of the highlights include the beauty contest “Queen of the Roses,” the rose-picking ceremony in traditional folk costumes, and the parade with folk music and dance, masked kukeri (read my post on the kukeri carnival), and traditional art. 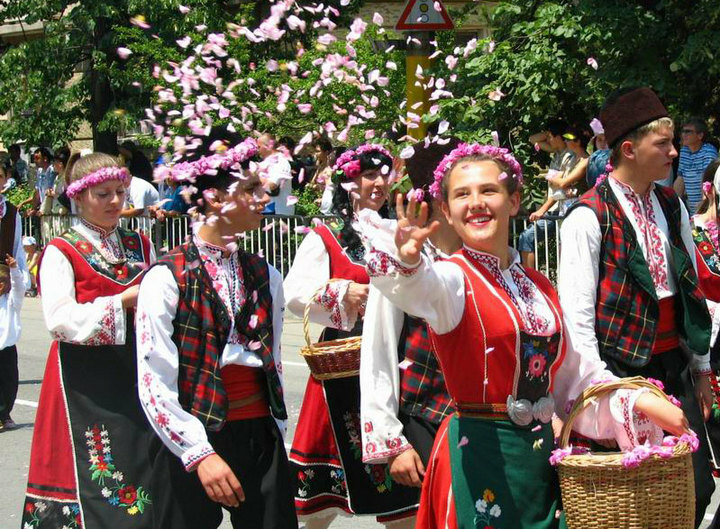 The rose festival in Kazanlak is a true celebration of beauty! 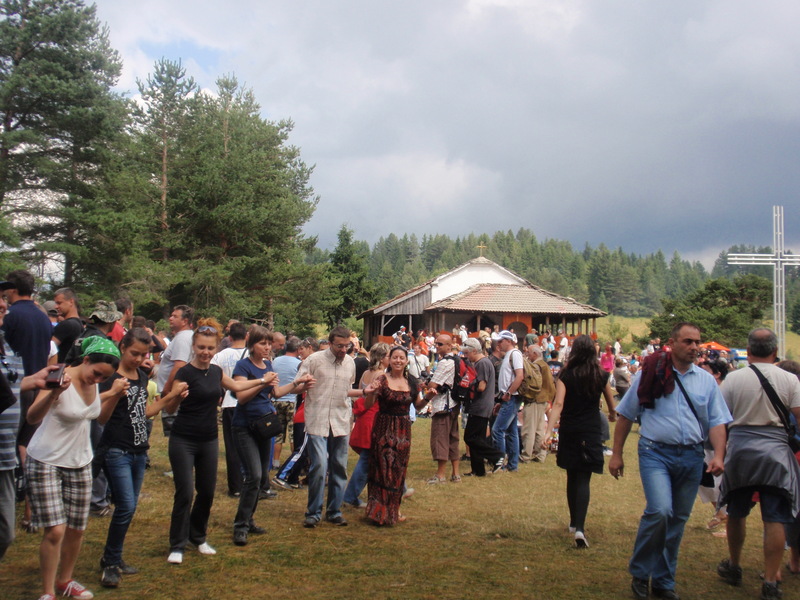 Did you read my post on the Festival of the National Costume in Zheravna? 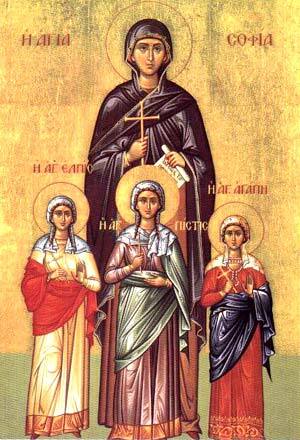 Today, September 17, Eastern Orthodox Christians commemorate the day of the martyr Sophia and her three daughters Faith, Hope, and Love (in Greek, Pistis, Elpis, and Agape; in Bulgarian, Vyara, Nadezhda, and Lyubov). Sophia was a pious woman who lived in Rome under Emperor Adrian (Hadrian), in the first century AD. She had named her daughters after the main Christian virtues, faith, hope, and love. When Emperor Adrian found out that the family openly observed Christianity, he ordered them to offer a sacrifice to the Roman gods. When they refused, the emperor ordered that the young girls, age 12, 10, and 9, be tortured until they rejected Christ. The girls were killed in the name of their religion and became martyrs. After Sophia buried them, she prayed for three days by their graves and finally died herself, believing she would join them in Heaven. In our culture, this day is the “name day” of those who bear the names Sofia, Vyara, Nadezhda, or Lyubov, and they receive guests at home. All Bulgarians celebrate, so that their families are healthy, happy, and filled with love. Today, we also celebrate the holiday of our capital, Sofia. 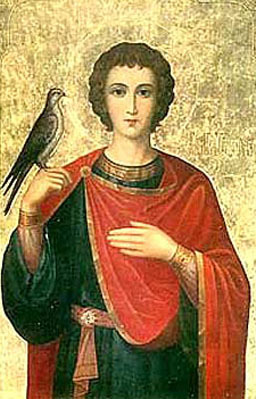 We have chosen this day to honor our city, although Sofia was not named after the martyr Sophia. In fact, the name of our capital signifies Wisdom. In Greek, Aghia Sophia means the Divine Wisdom of God. So today, I want to tell my mother, Lyubka, that to me, she signifies All the Love in the World. I would like to join the ongoing in Bulgaria public debate. In mid-August, the Ministry of Economy presented the video clips for the new advertising campaign for Bulgarian tourism under the slogan “Magic Lives Here”. 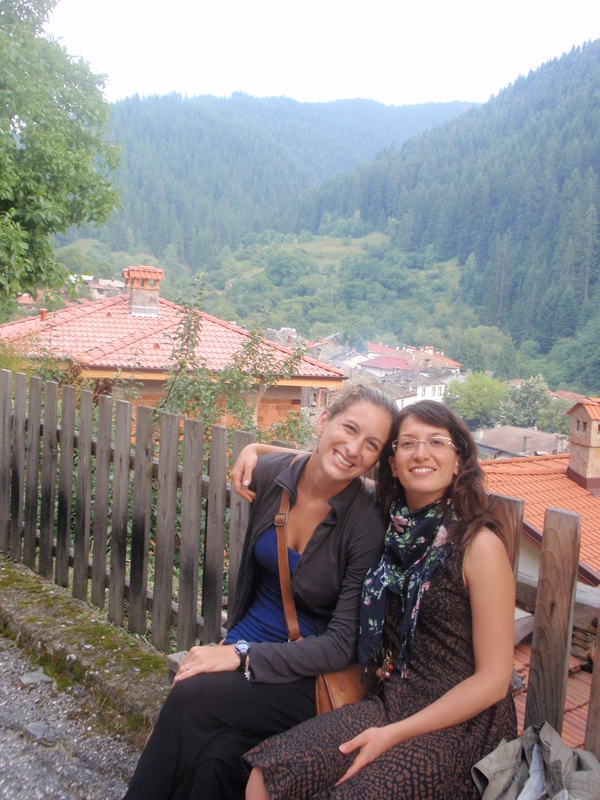 The campaign aims to change the perception of Bulgaria from a destination for low-cost European youth travel destination, to a more luxurious tourist destination. The four video clips focus on our Black Sea summer resorts, mountain ski resorts, SPA and wellness centers, eco-tourism and cultural heritage. They are about be broadcasted on four European TV channels: Euronews, Eurosport, Discovery, and National Geographic, in September (read more in Radio Bulgaria’s website). The project theoretically has a good perspective, but the video clips became notorious because the majority of Bulgarians don’t like them. Newspapers, TV shows, online media, politicians, intellectuals, and celebrities all took a stand in the public debate. The common opinion seems to be that the videos are full of clichés, that they copy other countries’ promo videos from several years ago, are outdated, are executed poorly, have bad quality, and don’t portray Bulgaria accurately. The most widely discussed aspect, though, is the campaign’s cost. The making and broadcasting of the videos totals at 7.5 million leva (3.7 million euro), which is a significant sum for a country of this size. The campaign is partially funded by the EU. Experts in the field of advertising agree that the production price, almost half a million leva is way too high. Many common people believe that this money would have served better if it were invested in infrastructure. One is for sure, an ad campaign can always be improved. You are either very happy or very miserable on Valentine’s Day; there seems to be no middle position. For most people. 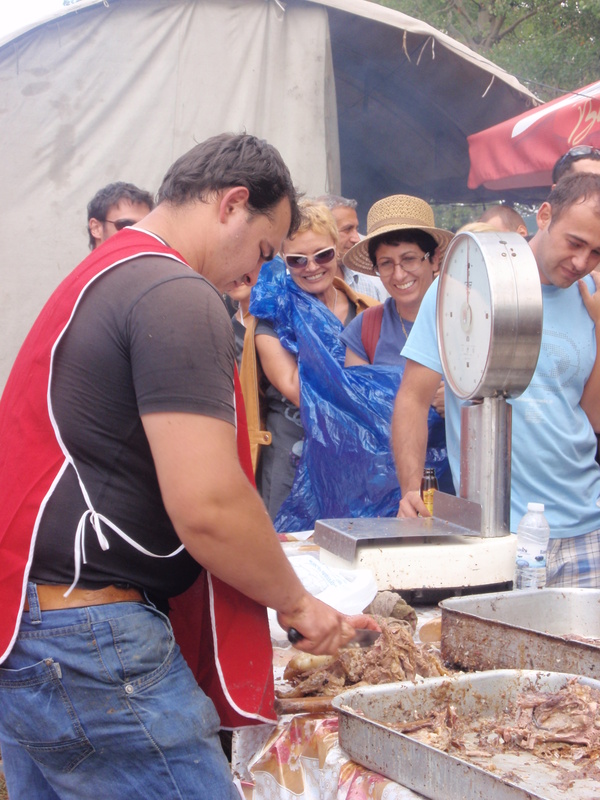 Bulgarians have found a simple solution to this problem of the extreme emotions. 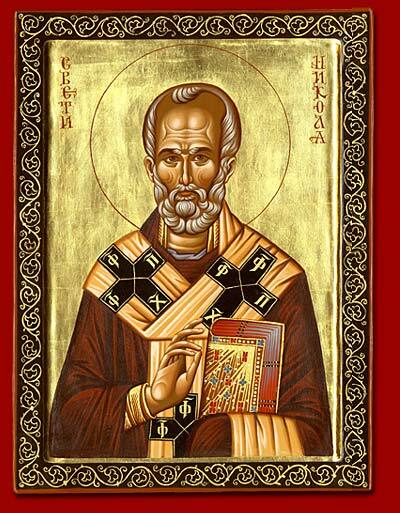 We celebrate two holidays on February 14th, St. Valentine’s and St. Trifon Zarezan! 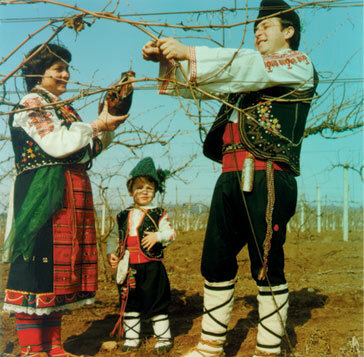 On the day of St. Trifon Zarezan, the guardian of vine-growers, we celebrate our love for wine! According to the old custom, this is the day when you prune the old twigs of the vine, so that it can sprout anew in the spring. This is an old ritual for vitality and fertility. Vine-growers, gardeners, winemakers, tavern-keepers, bartenders, and men called Trifon have a special day. Together with them, we all feast and drink wine. So, if your loved one is with you, celebrate St. Valentine’s! If not, get on some good wine and forget about love! Different saints for your different desires! 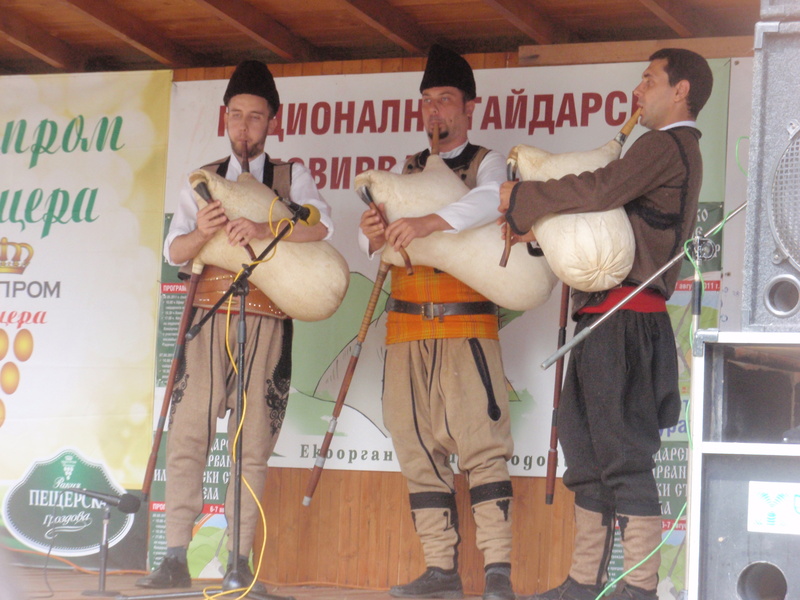 Read more about other wonderful Bulgarian traditions, Martenitzi and Kukeri Processions. Today Eva and I were thinking about the eternal songs that never fail to touch our souls. She named Ederlezi as her all-time favorite. Ederlezi is a song about the life of Gypsy or Roma people on the Balkans. 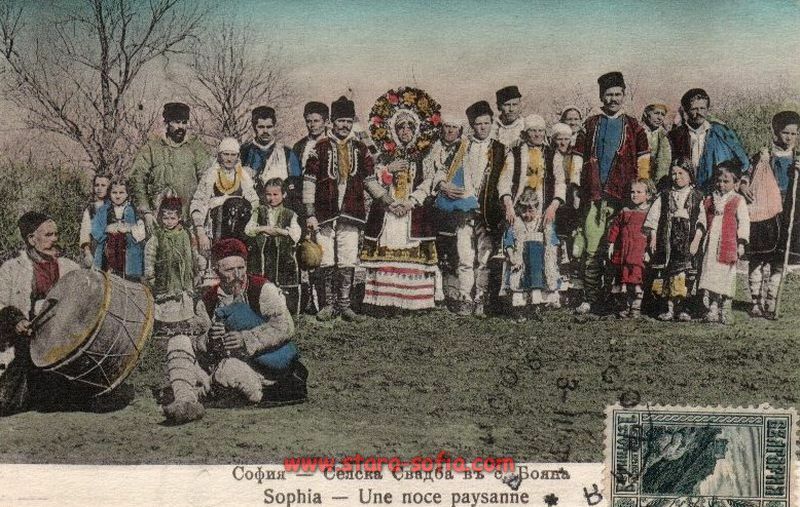 The name originally signifies a the Muslim holiday celebrating spring, but the Slavs on the Balkans have long ago assimilated this holiday into the Christian St. George’s Day. 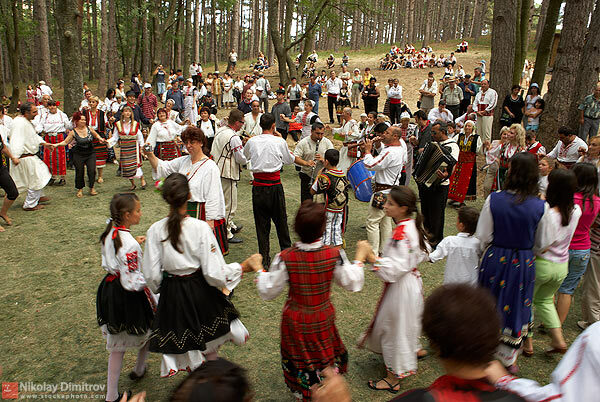 Ederlezi originated as a folk song and was immortalized by the music of Goran Bregovic. Today, there are versions of the lyrics in Roma, Serbian, and Bulgarian. The song I chose as one that always filles me with emotions is Horchat Hai Caliptus, or translated from Hebrew, Eucalyptus Forest. 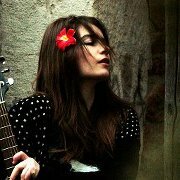 It is a song about the Palestinians and the Israeli, and the beauty of the Jordan river shores despite of any wars. The song is originally sang by Ishtar, but here I am posting a cover by Bulgarian Music Idol contestant Preslava Peicheva. I am sure that Ishtar wouldn’t mind this gentle voice singing her song. Both songs leave a bittersweet feeling in your heart. 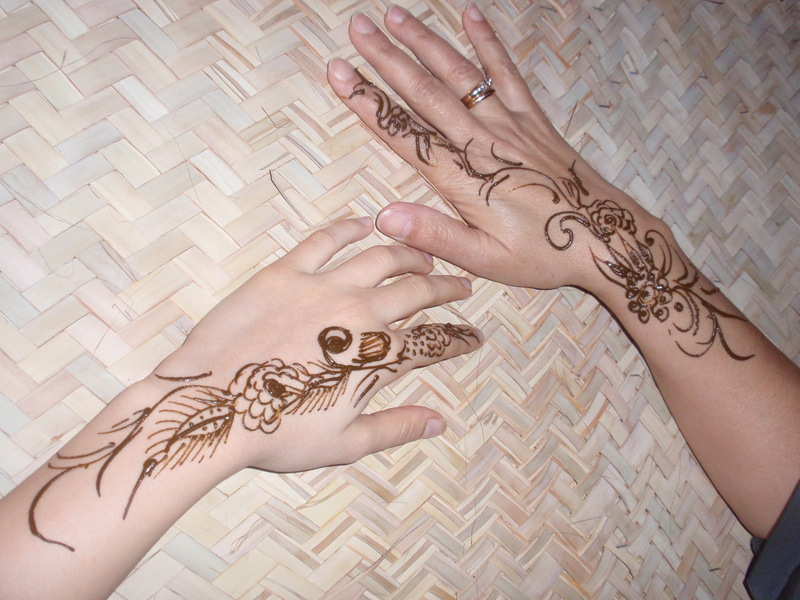 They are both about ancient peoples whose historical fates have been filled with turmoil, but whose culture and traditions have been kept alive through the years. I think this is what makes these two songs so powerful.